Yaaay! It’s Nicolas Cage time! Snake Eyes comes from my favourite era of the master’s work, the 1990’s. In this decade you had some downright excellent action films like The Rock, Con Air and Face/Off (not to mention his Oscar win). In the 90’s you could hardly move for all the Nicolas Cage. 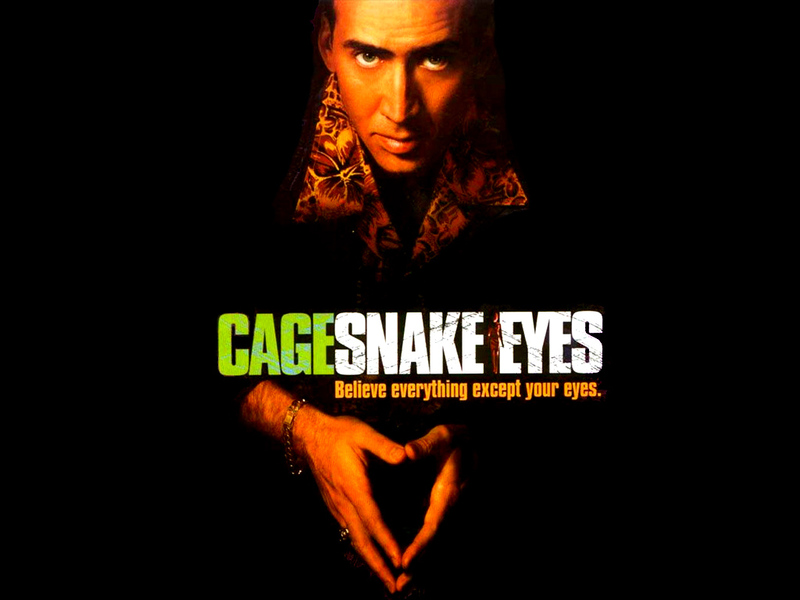 I feel Snake Eyes is one of the more underrated Nicolas Cage movies and I wanted to set that straight. Nicolas Cage plays Rick Santoro, a corrupt Atlantic City cop who switches between talking to his wife on one line to his girlfriend on the other without a second thought. He is played with gusto (perhaps an understatement) and flamboyance and is just so much fun to watch. This is Cage in his element. 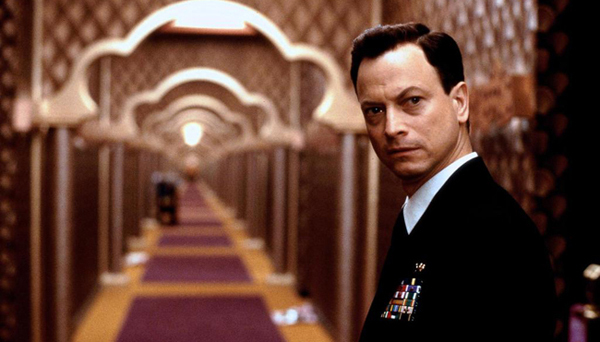 Playing his boyhood pal, Commander Kevin Dunne, is Gary Sinise. Now in this movie Gary Sinise has a great talent of acting like the friendliest guy ever one moment, and looking extremely evil the next. He’s a lot of fun to watch alongside Cage. They’re relationship is an interesting one as well, boyhood friends who took very different paths in life. Santoro stayed in the sewer and became a dirty cop whilst Dunne took the (equally corrupt) road into the military. Finishing off the supporting cast is the always awesome Carla Gugino who plays a mysterious woman who the two leads spend half the film trying to track down. One thing I noticed straight off was that director Brian De Palma does a great job. The opening shot is a seemingly non stop steadicam shot that weaves in and out of the stadium, up stairs, through corridors following Santoro as he screams at passers-by, chases down a thug and talks to his girlfriend and wife on the phone. The shot covers impressive ground and sets the stage for the mystery to unravel. I don’t even want to think how much work went into that shot, or how many failed takes there were. This is the film’s stand out moment I reckon, but the rest of the film is still shot impressively. There are a lot of impressive shots in the Once the film gets going, it has a similar gimmick to the recent Vantage Point. In that it shows the same event over and over from different characters perspectives. It’s done quickly, stylishly and with panache. But this is probably not De Palma’s greatest film. That accolade still lies firmly with Scarface. Nicolas Cage and Carla Gugino. Overall this is just an enjoyable movie. It’s entertaining, its flashy and its lively editing and directing keeps you on your toes. Perhaps its not the tense mystery thriller that people were expecting but the plot is interesting if not a little predictable. It’s not a long film so it never out stays it’s welcome and never feels boring or over-long. It’s not Brian De Palma’s best film, neither is it Nicolas Cage’s. But it is awesome and totally worth a watch.